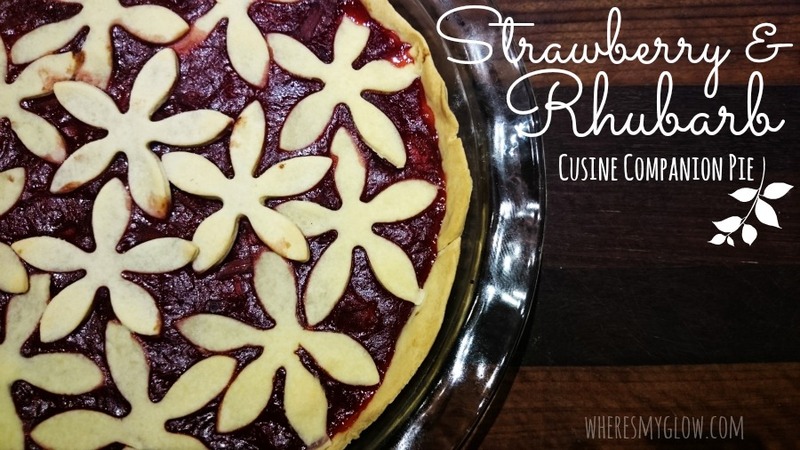 The Cuisine Companion bloggers were challenged to bake on the theme of Spring this month, which is perfect because a) it's spring here, and b) I'm all for seasonal eating, so Strawberry and Rhubarb Pie it is! I'm not against buying produce from overseas or out of state if needed (hello, Valencia oranges in Winter), but I do prefer my fruit and veg to have less frequent flier points than me. I got a whole stack of beautiful fresh, local ingredients delivered to my door for the challenge, and as soon as I saw rhubarb I couldn't go past a pie. Plus we'd just been strawberry picking in Gnangara, and the two are a match made in taste bud heaven. My family are rather obsessed with rhubarb, and we were even hoping to plant some to harvest in a few years because we go through so much of it. Place all the base ingredients in to the Cuisine Companion with the kneading/crushing blade, press pastry program and start. Yep, that's it. When it's finished, ball up the dough in cling film and leave it to firm in the fridge for 15 minutes, clean the bowl, but don't panic about being super thorough. 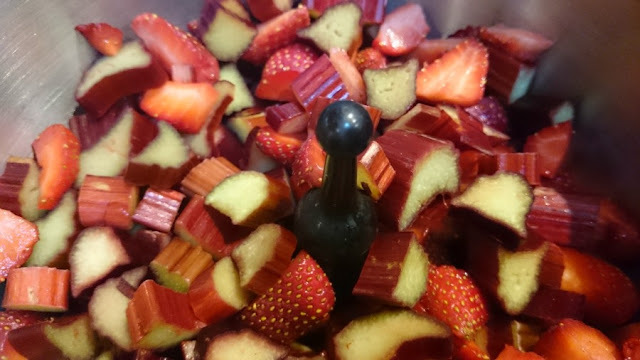 Chop your rhubarb and strawberries in to 1-2cm pieces and whack them in the bowl with the stirring blade. Set on speed 4, 100C, for 8 minutes. Your kitchen will start smelling amazeballs. While that's happening, grab your dough out of the fridge and divide it. 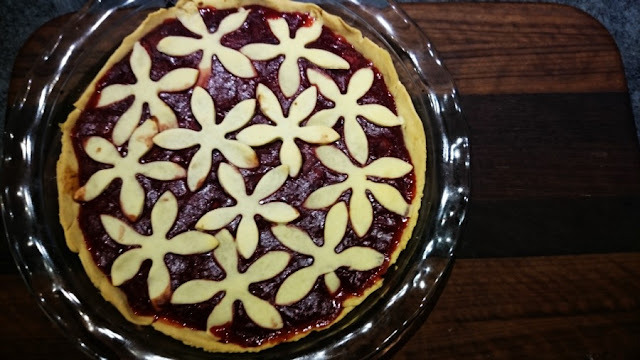 If you'd like a fully topped pie then use half the mixture, or if you'd like a lattice style pie with a bit of the ol' peekaboo happening, take out 3/4. This will become your base. Roll out your pastry portion on a floured surface until it's big enough to cover a lightly floured 24cm/9.5inch pie dish. Gently lift the pastry on to the dish and push in to the edges, trimming any overflow. You can put the excess back with the rest of the pastry if you need to, but the more your work the pastry, the less forgiving it becomes. Blind bake the base using baking paper and ceramic stones or uncooked rice in your oven for 15 minutes at 190C. When done, remove the stones and put aside until it is cooled slightly. If the Great British Bake Off taught me one thing, it's that blind baking helps minimise the chances of a "soggy bottom". Nobody likes a soggy bottom! When your Cuisine Companion beeps, add your sweetener and the gelatin, set on speed 4, 100C for a further 4 minutes. When finished, pour the mix on to your base. 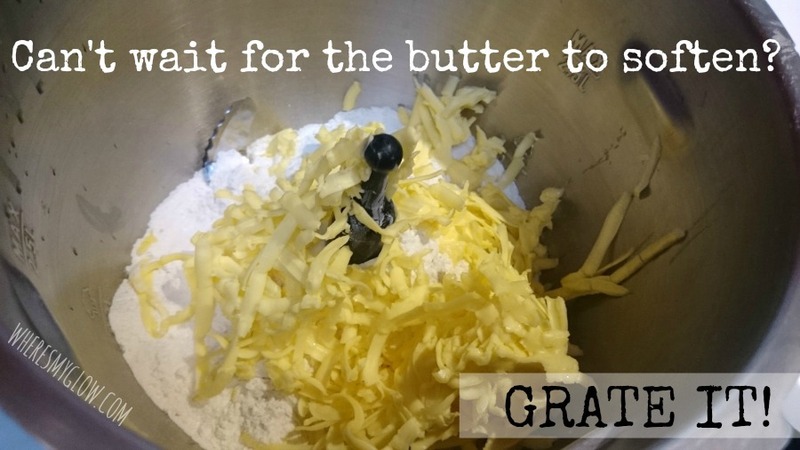 Roll out your remaining pastry on a floured surface and shape or cut how you'd like it. If you are covering the entire pie make sure to leave a steam hole somewhere or your pie will explode in the oven. It's not pretty. Trying to keep with the spring theme, and also because I'm a bit of a wanker, I used a flower cutter and arranged the blossoms around the edges and worked my way in. Place in the oven for 20-30 minutes at 190C or until golden. 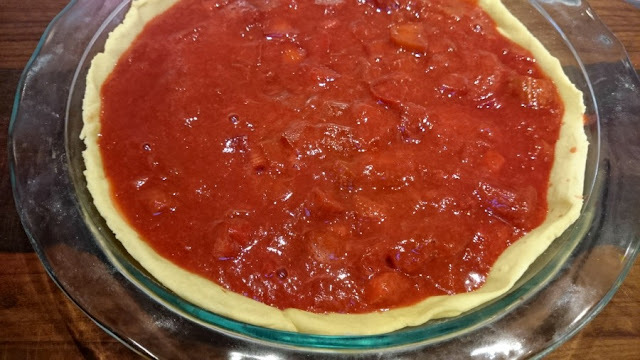 Allow to cool slightly before serving because the pie filling will be like molten lava at first. Serve with a dollop of vanilla bean icecream and enjoy!